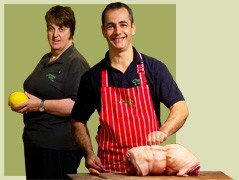 We pride ourselves on our huge selection of local food and drink from the finest Welsh suppliers. There is lots of free parking around the shop and we are also wheelchair and push chair friendly. We sell exceptional quality meat from our own Texel cross lamb and Hereford traditional beef here in our fully stocked butchery – you don't get more local than that! Our opening times are - Shop: Mon-Sat, 8am to 5pm; Sunday and Bank Hols 8am to 3.30pm. Grill café: Mon-Sat 8am to 4.30pm (last orders 4pm); Sunday and Bank Hols 8am to 3.30pm (last orders 3pm). Our grill offers some of the finest home cooked food for miles, using the best ingredients (local if possible) and traditional family recipes. There’s a big Family Fun Day planned for the Spring Bank Holiday Monday at Cwmcerrig Farmshop and Grill in Gorslas. The Fun Day is 10am-2pm on Monday, May 2. Come and visit or drop us a line!